Item revisions are a good way to track the development of an item and its content. Content is autosaved as you type, which can be compared to see the different versions of the content over time. You will be able to see who made the content edits, what content has changed and when the change was made. 1. Open the Revision history of an item, by clicking the Settings menu. By default, you'll the most recent changes on the item, which are contained in the latest revision. 2. 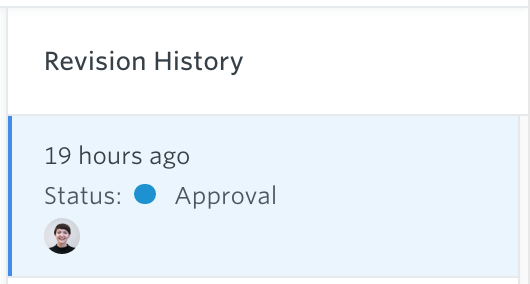 Click the time and date of the revision you'd like to see the changes for. Each revision shows the changes between the selected version, and the earlier save version. Changes made by one person will be shown together in one revision entry. You can see who made edits as part of a revision by the users' avatars. Changes between the two versions will be highlighted to make it easier to see what’s been edited. 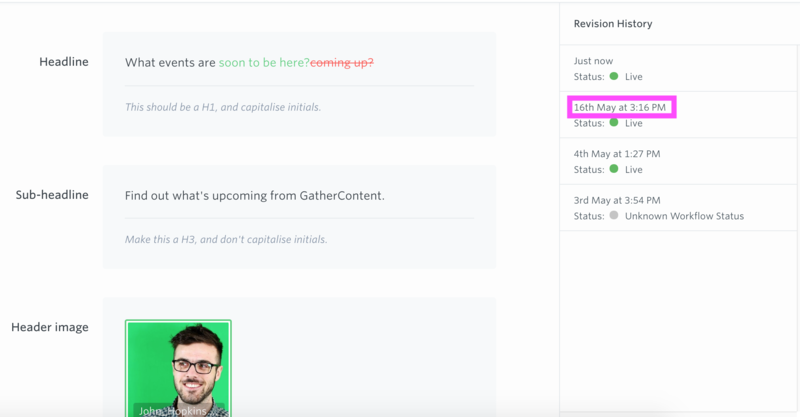 Removed content or assets will be highlighted in red, and content or assets that have been added will be highlighted in green. Content style changes will also be highlighted in purple. You can also see the workflow status of the item at each save point. You may exit the revision history view (and head back to the item itself) by pressing the 'back' arrow in the top left. NOTE: If you have upgraded to the new content editor, previous revisions which took place in the legacy editor will not be available.